The Tancredo Neves International Airport (IATA: CNF, ICAO: SBCF), located in the adjoining municipality of Confins, is the main airport serving Belo Horizonte and the surrounding metropolitan area. The other two major international airports in Brazil are São Paulo – Guarulhos (GRU) and Rio de Janeiro – Galeão (GIG). From these airports, one can easily get connecting flights to Confins (CNF) in Belo Horizonte. Moreover, although the airport is located 38 km (24 mi) north of downtown Belo Horizonte and 44.5 km (28 mi) from Expominas, it has several companies that offer bus transportation, taxi and shuttle. It is strongly recommended that all visitors use one of these licensed services at the airport. 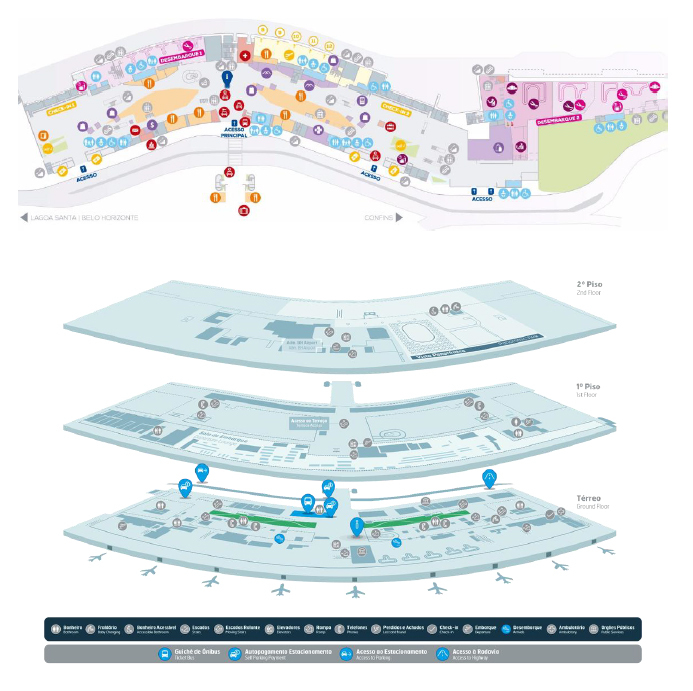 More information can be found at http://www.aeroportoconfins.net/en/. Discover the facilities offered for your trip with the official travel agency: Master Tourism. We offer a series of services so that your stay during the Congress be more agile and comfortable. The bus stop is located near the main entrance and information stand, on the Ground Floor, where you can also purchase tickets. It takes approximately 50 minutes to reach the final destination (Avenida Álvares Cabral, 387) and the ticket costs R$ 27.70, between 8 and 9 USD. There is only one intermediate stop at the Ouro Minas and Ramada Minascasa hotels. There are other bus services available at the airport, but it is strongly recommended to take this option. Once at the final bus stop, you may take a taxi or use a mobile application service, such as Uber, to your destination. Please consider the following cost estimates regarding Expominas and suggested hotels. All listed hotels can be reached within fifteen minutes or less. You can take a taxi or use a mobile application service from the Tancredo Neves International Airport directly to your destination. There are four companies currently authorized to take passengers from the airport, which are listed below and operate from Terminal 1. Most companies offer booking in advance options. In the International Airport, you may choose from the four companies previously mentioned. We discourage using taxi companies other than these four at the airport. However, in the city, taxis are identified by a red plate and a sign on top of the car. Please consider that drivers may not speak English or carry credit card machines. Due to the location of the official hotels the metro is not a practical transportation option. For hotels close to the downtown, however, it is a good option. Expominas has a direct connection with the Gameleira Station. Take the train heading to Eldorado Station, step off at Gameleira Station and follow the signs to the footbridge to Expominas.